Dr. Tony Pasquale is passionate about giving unparalleled service and achieving outstanding treatment results. He feels that he is truly blessed to be able to play such an important role in giving people a healthy, beautiful smile and the lifelong confidence that comes with it. By utilizing evidence-based treatment plans and technology such as 3D Scanning, he is able to treat patients in a conservative manner, in many cases avoiding extractions and unnecessary jaw surgery. After practicing in the US for over 11 years, Dr. Pasquale moved his practice to St. Catharines with a simple goal: treat people the way he would want to be treated. It starts by thoroughly assessing each person and providing personalized orthodontic care for his patients. He creates customized treatment plans to improve one’s smile in a way that best suits a person’s natural facial features. Dr. Pasquale respects your preferences and believes in working together with the patient to help achieve one’s orthodontic goals. His focus is not only on achieving a perfect result, but also on efficiency to ensure treatment is completed in a timely and comfortable manner. He believes orthodontics should be a fun family experience. That is why we always welcome parents, family, and friends in the clinical treatment area to observe, ask questions, or just hang out! Dr. Pasquale graduated from Holy Cross Secondary School in St. Catharines Ontario. 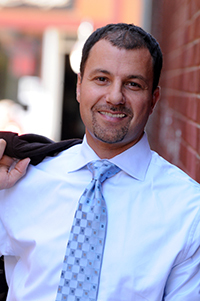 Dr. Pasquale then completed his undergraduate studies at Brock University in 1997, earning a Bachelor of Science degree in Biotechnology with Honours and won numerous academic awards. Dr. Pasquale continued his formal education at Albert Einstein Medical Center (AEMC) in Philadelphia, completing a 3-year specialty program in Orthodontics and Dentofacial Orthopedics. He was the first and only Canadian ever to be selected into AEMC’s orthodontic program. He served as chief resident in this hospital-based program and was exposed to many complex orthodontic and surgical cases. He successfully passed the American Board of Orthodontics exam involving both a written portion as well as the presentation of treated clinical cases in front of an expert panel of board members. Dr. Pasquale successfully ran 3 hospital-based orthodontic practices in Pennsylvania and New York prior to moving back to St. Catharines, Ontario. Having a hospital-based practice allowed Dr. Pasquale to be exposed to a high volume of complicated orthodontic and surgical cases. He was fortunate to be able to work with many other dental and medical specialists in the hospital, an experience that helped foster the team-based approach to his treatment philosophy. He is proud to be able to bring back this valuable experience to the St. Catharines area. Dr. Pasquale and his wife were both born and raised in St. Catharines, Ontario and have 2 wonderful children. In his spare time he enjoys music, sports, cycling, traveling and spending time with his family. Dr. Pasquale and his wife previously lived and worked in the US for 11 years after finishing their education, however strong family ties and a desire to serve their hometown community brought them back to Canada to practice in St. Catharines, Ontario. Dr. Pasquale and his family are so happy to call St. Catharines home again!